This week was packed with high-profile hearings on Capitol Hill. Education Secretary Betsy DeVos, Treasury Secretary Steven Mnuchin, Attorney General William Barr, EPA Administrator Andrew Wheeler, Deputy Attorney General nominee Jeffrey Rosen — all testified before Congress. 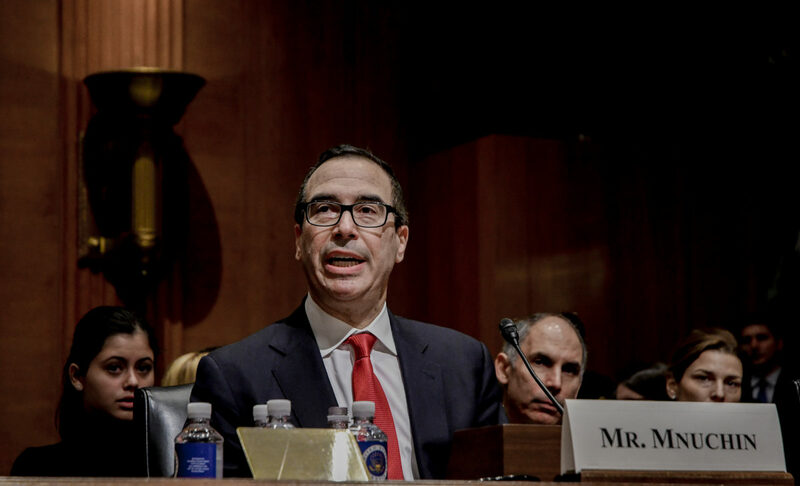 During his appearance before the House Appropriations Committee on Tuesday, Mnuchin said that Treasury lawyers had consulted with White House lawyers about the potential release of President Donald Trump’s tax returns, which were requested by Ways and Means Chair Richard Neal last week. Neal had given Mnuchin a deadline of Wednesday, April 10, which Mnuchin missed — House Democrats were invoking a law stating that the treasury secretary “shall furnish” the records to Congress upon request of the Ways and Means chair. On Wednesday, DeVos appeared before the House Education and Labor Committee and faced questions about Education Department policy that favors for-profit institutions and charter schools. We obtained resumes of Education Department political appointees that mirror DeVos’ prioritization of charter and private schools over traditional public education: only a fraction of the appointees hired by DeVos when she took office listed any experience in public schools on their resumes. Barr spent two days on Hill answering lawmakers’ questions, but it was his second day that garnered the most attention. On Wednesday, Barr told a Senate subcommittee that he believed that FBI spying on the Trump campaign “did occur,” though he provided no evidence. It was an inflammatory statement to make at the same time that Congress and the public are awaiting the attorney general’s release of the Mueller report. Barr has said that he intends to release the report next week, but questions remain about how much of it he will redact both for the public and for Congress. But it’s not just Mueller’s report that should be shared — Congress must also see the Mueller team’s extensive investigative work. And setting the precedent for this legislative branch oversight were none other than congressional Republicans, as American Oversight’s chief oversight counsel Molly Claflin explains over at the Daily Beast. Purge at Homeland Security: The week began with an alarming spate of firings at the Department of Homeland Security, as the president’s frustration with officials reportedly resisting his hardline anti-immigration proposals led to the ousting of Secretary Kirstjen Nielsen and Secret Service Director Randolph Alles as well as the withdrawal of Trump’s nomination of Ron Vitiello to head Immigration and Customs Enforcement. The shakeup has sent Kevin McAleenan, the commissioner of Customs and Border Patrol, to the top of DHS, and career official Matthew Albence to the top of ICE — but our investigation of Nielsen’s role in the administration’s family-separation policy isn’t going away. “We Have Direct Access to Him”: A spokesperson for David Bernhardt — who on Thursday was confirmed as the new interior secretary — said that Bernhardt has had no contact with two officials from the International Petroleum Association of America who can be heard boasting of their “direct access” to Bernhardt on a recording published by the Center for Investigative Reporting. We want to know if the spokesperson’s claim is true, and are asking for communications that could shed light on what if any relationship Bernhardt has had with IPAA since he joined the administration. New “Religious Freedom” Division: The Department of Health and Human Services created a new division within its Office of Civil Rights, known as the Conscience and Religious Freedom Division. Critics have argued that the office’s creation represents a win for conservative religious groups and could lead to discrimination. We want to know who is staffing the division, and have asked for records of any decision memos or policy documents. “So Be Careful”: Back in October 2017, the director of the Bureau of Safety and Environmental Enforcement, Scott Angelle, provided his cell phone number to a meeting of an energy industry organization, instructing attendees to call him and warning them that texts and emails are public records “so be careful.” He added, “This is a business opportunity to engage with me on what you believe we ought to be about.” We’re asking for Angelle’s phone logs to find out about any calls that have taken place thanks to his advice on how to avoid public records laws. Chemical Safety: In January, senators sent a letter to the EPA inspector general, calling for an investigation into allegations that Trump administration officials had impeded inspections at facilities in EPA Region 5 that emit ethylene oxide, a cancer-causing chemical. We filed a FOIA request for communications that EPA officials had about ethylene oxide and for any final guidance or instructions about inspections in Region 5. Trump’s “Spiritual Adviser”: Pastor Paula White is a member of the president’s evangelical advisory board, and has been a frequent presence at the White House. White has said that she has enjoyed the role of an unofficial adviser to the president, advising him on issues like hurricane response and the U.S. embassy in Israel’s move to Jerusalem, and continues to use her connection to Trump to solicit funds for her personal ministry. We want to know more about her role and influence, and are asking for communications she’s had with political appointees at various government agencies. Spending Taxpayer Money at Trump Properties: CNN reported this week that Defense Department employees have charged more than $300,000 at Trump properties since Trump took office, including at the Trump International Hotel in Washington, D.C., and at the Trump National Golf Club in New Jersey. The president’s unprecedented ability to combine public office with personal profit has been a running theme of his administration — in late February, we reported that 14 federal agencies had told us they had no records of any general ethical guidance for federal employees spending money at Trump-owned businesses. Multiple other agencies — including the Defense Department — have not responded to the request. No Records Here: Earlier this year, the White House announced that it would be creating a committee intended to challenge the science surrounding climate change. The panel is reportedly to be headed by William Happer, a climate skeptic who believes excess carbon dioxide in the atmosphere is a good thing. The White House Council on Environmental Quality told us this week that it has no records of communication with Happer. No Records Here, Either: Back in January, members of the Trump administration — including Secretary Nielsen — made a number of misleading statements about terrorism and immigration. We filed a FOIA request for DHS talking points regarding the number of known or suspected terrorists apprehended at the border to find out whether those misleading claims were part of the administration’s efforts to get funding for a border wall. This week, DHS told us it had no such records.